Warm honey gold with shimmering sandy highlights. Rich and pleasing. Marmalade, ground coffee with whispers of crushed almonds, marzipan and spice open the initial bouquet of complex aromas. Matured for 30 years in the finest wood, you can easily taste the influence of our Spanish Oloroso sherry butts. A treasure chest of flavours gently unfolds on the palate and exposes its many hidden secrets. Warm, sensual and inviting. Citrus fruits, sweet mango and wild berries tease the tongue with their tantalising flavours. Enjoy subtle hints of freshly cut pineapple, tangy grapefruit and cranberries. This fruit bowl of abundance truly rewards the palate providing it with a long-lasting memorable after taste. As the sating goes ‘all good things come to those who are prepared to wait.’ Outstanding. On the face of it any official 30 Year Old whisky should blow your socks off, sadly at best I felt like I had lost a sock after trying this whisky. Full of beautiful aged flavours and polished almost to perfection on the palate. Yes there is advanced wood ageing flavours and the heavy Oloroso use has worked well delivering an array of complex and beautifully indulgent flavours. However, this was as satisfying as a glossy picture of your favourite dessert and not actually getting the dessert itself. 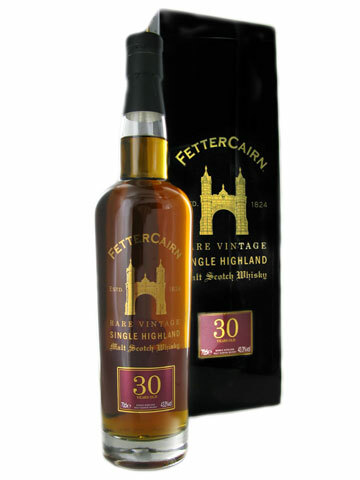 Good value for money for an official 30 Years Old bottling, plenty still available as Fettercairn seems to be one of those under-the-radar distilleries. I suspect this will not be a good investment bottle, so only buy one if you want to enjoy drinking it.